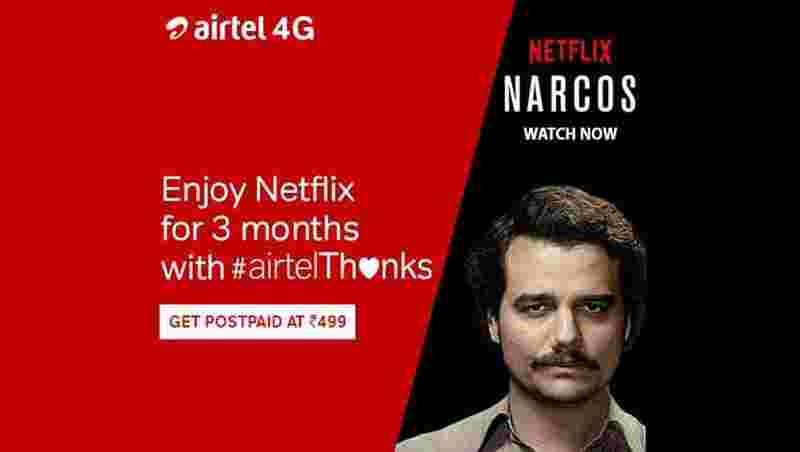 The teaser that Airtel has been sending its customers says, "Enjoy Netflix for 3 months with #airtelThanks. Get Postpaid plan Rs 499." Telecom-giant Bharti Airtel has been introducing various offers for their prepaid customers to take on Reliance Jio, which has disrupted the market by starting a tariff war that has forced a massive consolidation exercise in the sector. After aggressive launches in prepaid packs, the Sunil Mittal led company has now buckled up for its attack in postpaid category too. In the latest development, Airtel is sending notification to its customers asking them to avail the postpaid plan of Rs 499. Under this plan, Airtel gives 3 months subscriptions of Netflex. Once you make a postpaid recharge of Rs 499, you are automatically given the 3 months subscriptions of Netflix. With this, you can now enjoy your favorites shows like Sacred Games, Narcos, Stranger Things, House of Cards, Orange Is The New Black and many more. Apart from this, you can also enjoy movies and series on Amazon Prime Video, Zee5 and Airtel TV for free under this postpaid plan. Others do not have 3 months subscription, it is only available especially for Netflix. There is also handset protection given under this plan. Going ahead, the plan generally offers a total 75GB data on monthly basis, this would mean 2.5GB data per day if taken 30 days into consideration. The company also gives unlimited local and STD roaming calls along with outgoing ones as well. If you want to switch to this Airtel postpaid plan, then you can visit Airtel’s official website and login using your Airtel mobile number. You will get an password/ One-Time-Password for logging in. If you are a new customer, then you can register yourself by mentioning your mobile number or service ID along with password.